February is the month of love and since we absolutely love our customers, we are pulling out all the stops! 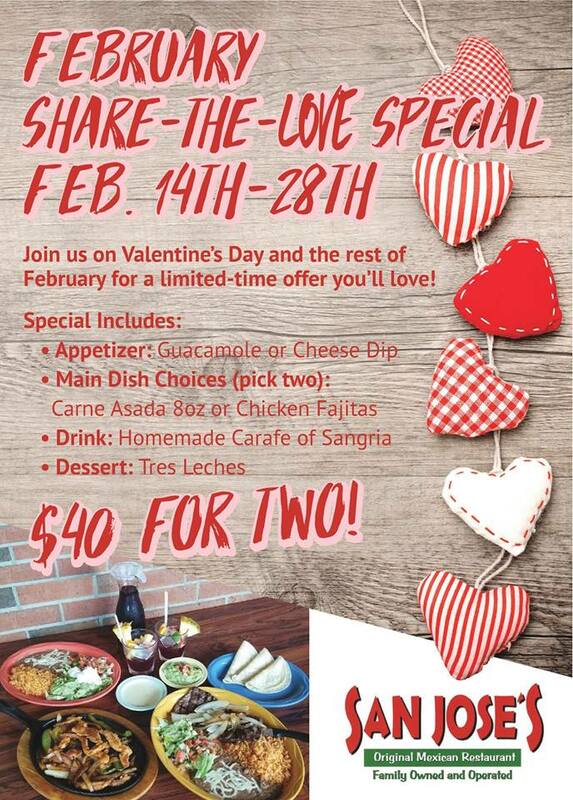 Head into your favorite San Jose’s Original for some authentic Mexican beginning on February 14th and lasting through the end of the month for our Valentine's Day/Share-the-Love Special! You and a friend will get all of that for only $40 for the two of you! You read that right! You can treat yourself and your galentines, Valentine's, parents, or whomever else you'd like to eat with during the month of February for only $40! To make things even more special, if you share a photo of your love platter on Facebook and Instagram with the hashtag #ShareTheLove and tag your favorite San Jose's Original location, you will be entered to win a $30 Gift Card for use at any of our locations! Have a little heart-to-heart and tell the people you love, just how much they mean to you! We’ll see you for Valentine’s Day (and maybe every day after for the rest of the month)!